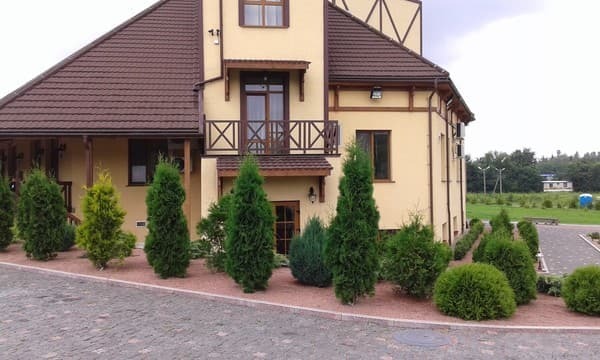 Restaurant and hotel complex "Shale" is located 5 km away from the center of Zhitomir. It offers comfortable 2-bedded rooms "Standard" and "Lux". 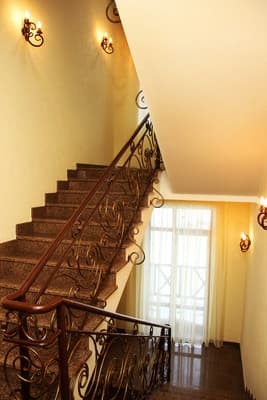 The comfortable rooms are decorated in a classic style and pastels colors, and are equipped with everything necessary. 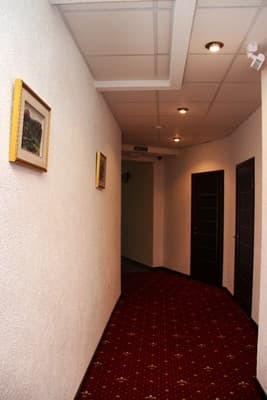 All rooms are equipped with air conditioning, telephone, TV; private bathrooms are equipped with modern plumbing. Free Wi-Fi is available all over the complex. Guarded parking is included. 24/7 reception. The restaurant serves classic Austrian and European cuisine. "Shale" is located on the 1st km of the highway Zhitomir-Berdichev, in 15 minute-drive by public transport from the city center. Description of the room: One room for 1 person. There is a TV, air conditioning. A hairdryer is available on request. Slippers are available at an additional cost. 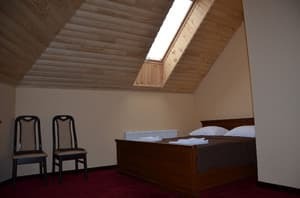 Description of the room: One room for 2 people. Rooms with a double bed or 2 separate. There is a TV, air conditioning. A hairdryer is available on request. Slippers are available at an additional cost. 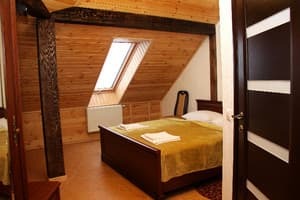 Description of the room: Spacious room with a double bed and a sofa. The room has a TV and air conditioning. It can accommodate 3 people for an extra charge. Children up to 5 years stay free of charge. 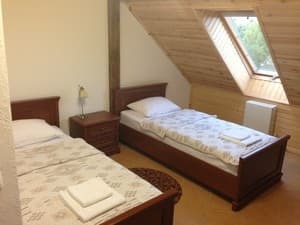 Extra bed costs 150 UAH/ day. Pets are allowed to stay after consultation with the administration. Service costs 100 UAH. 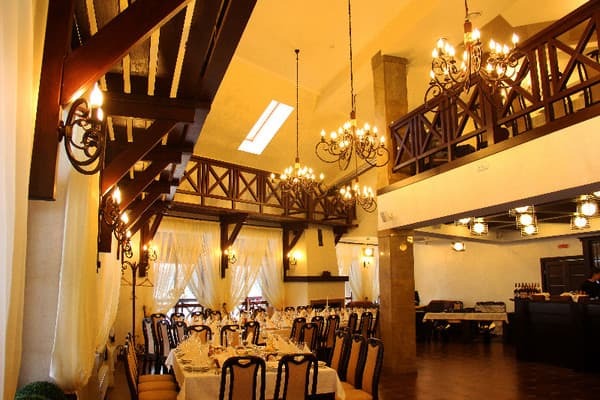 The hotel restaurant serves classic Austrian and European cuisine. 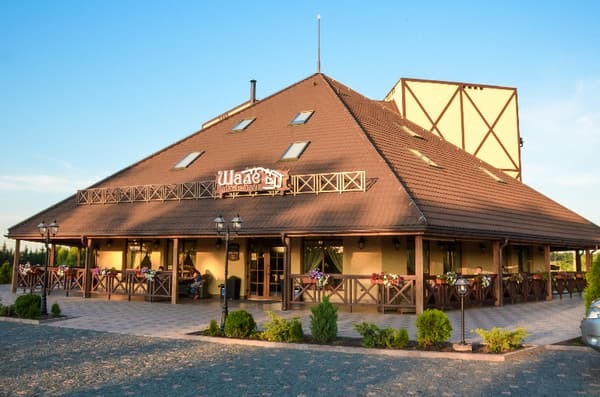 Restaurant and hotel complex "Shale" is located on the 1st km of the highway Zhitomir-Berdichev, 5 km away from city center.